Hotel Victoria, Interlaken, Friday, 26 July 1878: A dull, rainy day in very small, incommodious rooms – Mary [Gray]’s especially gloomy – the poorest hotel for its pretensions we have been in. We left Giessbach yesterday – a clouded sail on Brienzer-See – and 10 minutes rail road ride brought us here. We left the Linzee party at Giessbach, and find the Curtises left their hotel here for Bern several days ago. A most welcome lot of letters, at least 2 doz., awaited us here after our fortnight’s letter-famine – encouraging letters from Drs. Brown & Bethune to our dear Dr. [Gray], also from F.C.G., E.G, & H.G. ; and to me from R.G., R.P.W., S.F.G., [and] P.M.C. [The diarist’s sister] S.M.L. tells me of great trouble come upon our old friends the MacTiers (Wm. & Anna) through the dissipated habits of their only son, whose neglected wife (a poor girl, [he] married her in a drunken fit) was found dying on a door step, having taken laudanum for the purpose, leaving a pitiful letter addressed to him in her pocket. Of course the whole affair came out in the papers, to the intense grief & mortification of his family. A terrible cable dispatch announces the defalcations of John G. Tappan of Boston as treasurer of some Belting mills; he has used a half million of the corporation’s money, & gives up all he has in the world to meet the liabilities, of course; but what is to become of his poor wife & his daughters, all accustomed to luxury & ample means; proud girls, too, to have such a blow fall on their heads, as the loss, not of money, that is a small thing in comparison, but of character & repute & honorable position for their father. They have been neighbours of ours for many years – and the girls are familiar, but never intimate, school friends of my children; we feel it a great shock – Mr. Tappan must be about my husband’s age – never a popular man, but supposed to be upright & prosperous, heretofore; a pitiful close to a long business life. Oh God, how is it that so few seem able to stand in the hour of temptation, against the alluring opportunity wh. the control of large funds throws into their power? The end is always ruin to purse & character – and a blighted life & name to all who belong to them – yet every man who falls thus, no doubt means to restore all, and thinks he is safe – and every such fall, especially where the delinquent is an elderly man who has led a respected & apparently respectable life, is a shock to the credit, confidence, & moral sense of the community, and a fearful example to others, whom it yet does not seem to warn off the same perilous ways. Hedwiga Regina Shober (1818–1885) was married to Dr. Francis Henry Gray 1844–80. In 1878, they were traveling with their daughter Mary Clay Gray (1848–1923) and son Samuel Shober Gray (1849–1926). This entry comes from the Hedwiga Regina Shober Gray diary, R. Stanton Avery Special Collections. Dr. Gray’s Boston colleagues, Dr. Buckminster Brown and Dr. George Amory Bethune. Dr. Gray’s son Francis Calley Gray (1846–1904), his sister Ellen Gray (1830–1921), and his brother Horace Gray (1821–1901). Mrs. Gray’s best friend, Rebecca Parker Wainwright (1820–1901). 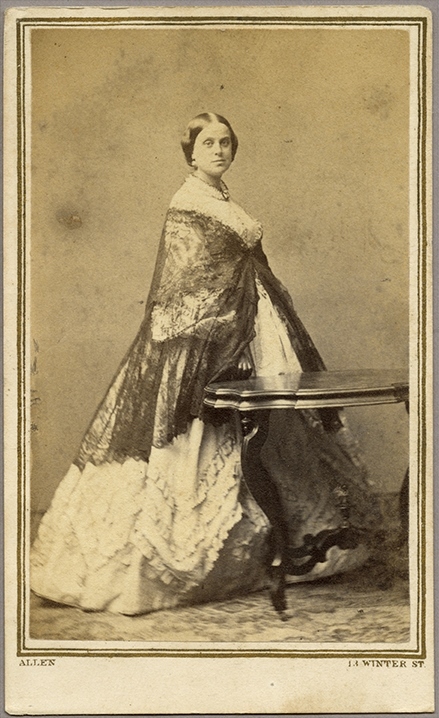 The diarist’s sister-in-law, Sarah Frances Loring (1811–1892), who married William Gray in 1834. Mrs. Gray’s cousin Phebe Morris Kimber (1821–1892) was married to Samuel Hicks Clapp 1845–48. Sarah Morris Shober (1825–1917) was married to the Rev. William Phillips Lewis 1868–93. Presumably William Lawrence Mactier (1819–1888) and his wife Anna McCulloh (Green) Mactier (1827–1917). John Gallison Tappan (1808–1883), who married Eliza Lawrence Trask in 1839. In Ashburton Place, near the Grays on Bowdoin Street in Boston. How true those last two paragraphs, even today. Ditto on those last two paragraphs – so well said. Beautifully apt. A half million dollars in today’s dollars was a lot of money at that time.